Aug 17, 2017, New Delhi, India:The Swachh Bharat Mission is in its fourth year and building more public toilets has been an important part of this mission. As Indians struggle to find working toilets in public areas, public urination remains a big problem. The government has been trying to build toilets but the huge population that the country has, they will never be enough. Citizens on LocalCircles have been sharing pictures of lack of functional toilets at petrol pumps. In a recent share, a female member shared a picture of a pump in the heart of Lutyens Delhi with only male toilet and nothing for females. The post led to a widespread debate about lack of functional toilets at petrol pumps across the national and how should they work ideally. With over 40,000 votes and over 20,000+ unique participants from over 175 districts of India. 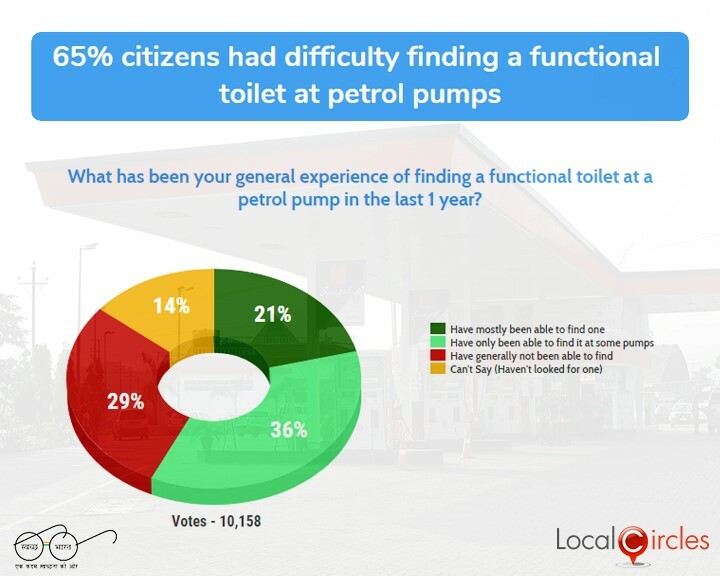 In the first question, people were asked how has their experience been in the last one year of finding a functional toilet at a petrol pump. In response, 29% said they have generally not been able to find one, 21% said they have mostly been able to find one, 36% said they have been able to find it at some pumps and 14% said they did not look for one. 10,158 citizens voted on this poll. 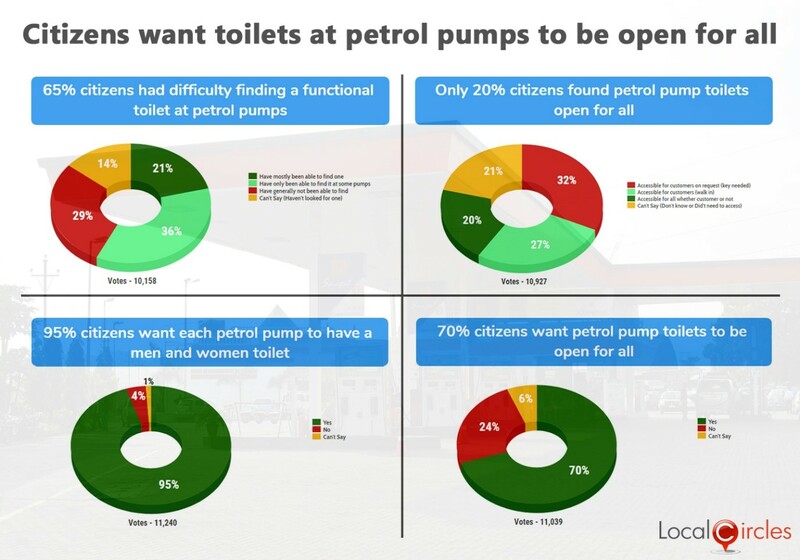 The second question asked people about the access to a toilet at a petrol pump whenever they found one. 32% said that the access was only given to customers on request as it was locked, 27% said it was accessible only to customers, 20% said it was accessible for all whether a customer or not and 21% were not sure about their answer. 10,927 citizens voted on this poll. 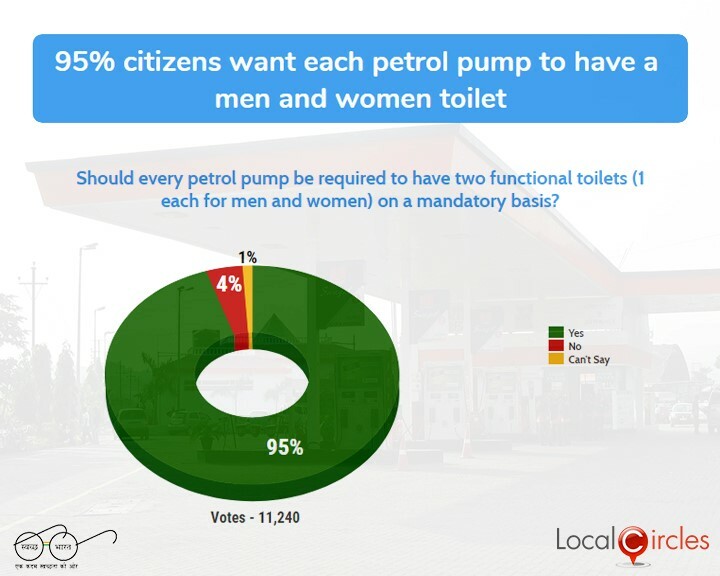 The third poll asked citizens if every petrol pump should be required to have separate functional toilets for men and women on a mandatory basis. 95% respondents agreed with it while 4% did not agree with it. A total of 11,240 votes came in on this poll. Many women reported in the structured discussions that while some pumps have both men and women’s toilets, a very few women’s toilets are functional. Many of them pumps still don’t have a women’s toilet. 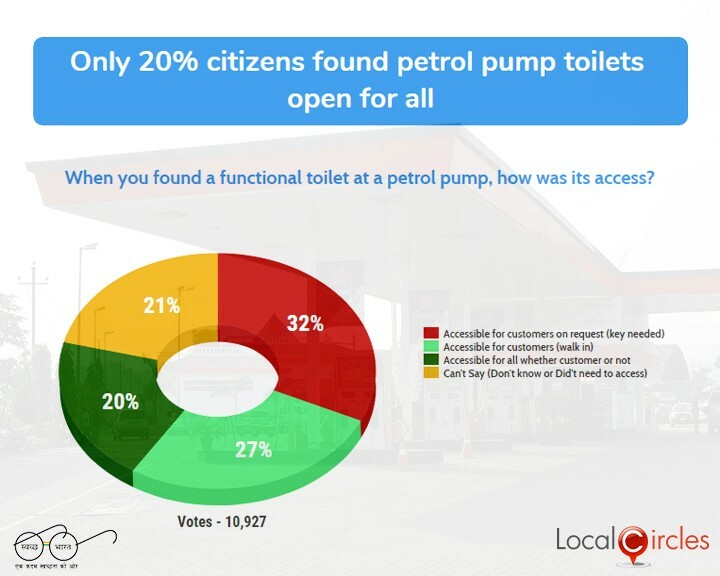 Citizens on LocalCircles have been debating whether petrol pump toilets should be made accessible for all like in most developed countries. 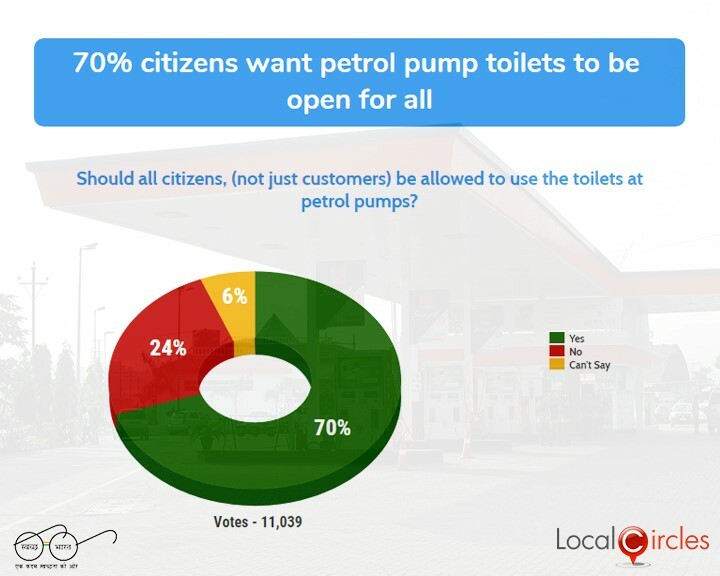 The fourth poll which received 11,039 responses, asked if all citizens (not just the customers) should be allowed to use the toilets at petrol pumps. 70% responded in an affirmative while 24% replied in a negative and 6% chose not to share their opinion. Petrol pumps had initially built toilets as it was mandated by the government but many of them lie in an unused/locked state now and there is poor enforcement by local municipal corporation as the results of the first two polls indicate. If free access to these toilets could be given to the masses, then the cases of public urination could drastically reduce. The move will also get big appreciation from women who always suffer from inadequate public toilet facilities. The petrol pump owners will have to build the maintenance cost into their financials but what citizens are seeking is that the Ministry of Petroleum, Government of India, while the oil companies mandates that a functional, open to all citizens toilet is a mandatory requirement for getting a pump license and renewing it. 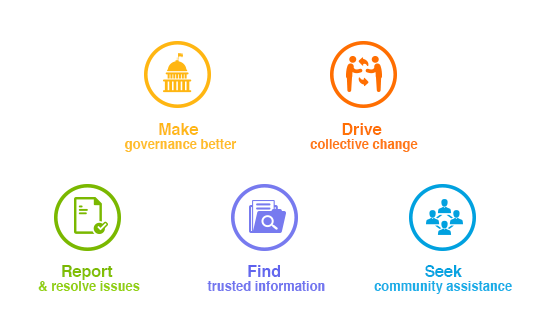 Citizens have also recommended that the audit and enforcement process should be conducted by the local municipal corporation, the oil company as well as by Ministry of Petroleum officials. In the event, violations are found twice, on spot license cancellation must follow, said citizens. LocalCircles will be making a submission of this citizen pulse to Ministry of Housing and Urban Affairs as well as Ministry of Petroleum for due action on these collective citizens ask.